Thanks to the frameless doors, the coupé-type roof line stretches low across the vehicle body visually, ending in the a long roof spoiler. The roof line arches slightly towards the flat sloping, strong D-pillars, which are supported by wide, muscular contours – the quattro blisters, reminiscent of the original Audi quattro. The shoulder line stretches the SUV, elegantly connecting the powerful wheel housings. Compact proportions, paired with a very low roof and a flat window form the rear end. A narrow, black high-gloss element with an integrated light strip extends between the rear lights. 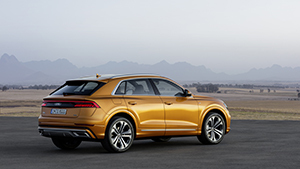 This is a feature of top Audi models, accentuating the width of the Q8. It creates an independent light signature day or night, just like on the original quattro back in the day. The distinctive rear diffuser has four vertical fins and an integrated tailpipe trim on each side. The operating concept in the Audi Q8 needs almost no buttons or knobs. It focuses on two high-resolution touch displays. This allows the brand to demonstrate how it transfers its uncompromising quality claim to the digital world. The upper display with 10.1 inch screen diagonal is used for controlling the infotainment and the navigation system. The lower 8.6 inch display allows the driver to manage the heating, ventilation and air conditioning as well as comfort functions and text input. The driver’s wrist can rest comfortably on the tiptronic selector lever during operation. The MMI touch response concept allows fast and reliable operation. A confirmation click can be felt and heard when a function is selected with a finger tap. The menu structure is intuitively logical and flat like on a smartphone, including freely configurable favourites and start screens. The systems in the Park plus assist package, which will be added to the range later on, support the driver during maneuvering. Manoeuvring assist counteracts imminent collisions with small steering impulses and independent braking to a standstill, for example when detecting pillars in a multi-story car park. Kerb warning protects against damaging the rims during parking. Several images from the surround cameras allow precise manoeuvring down to a centimetre and provide a view of crossing traffic and a detailed view of the wheels. The 3D view with freely selectable perspective is the highlight. The package also includes the (remote) parking pilot, which independently steers the SUV into and out of a parking space while monitored by the driver. The driver can get out of the car beforehand and trigger the process using the myAudi app on their smartphone. The remote garage pilot offers a similar level of convenience. Thanks to the laser scanner, it can move very close to walls and other obstacles such as bicycles in a garage. It forms part of the plus assist package, which combines all three packages.